Pricing Includes :	A one-color silk-screened imprint on one or two sides. Unless specified, orders will be set up as a one-sided imprint. Setup Charge :	Add $45.00 (G) for new orders. No initial Setup Charge on exact reorders. Assorted Colors are Available :	You may select any of the 14 colors offered or choose the following: "Colored Assorted" to receive Yellow to Green, Green to Blue, Yellow to Orange, Blue to Purple, Pink to Purple & Orange to Tropical Red. "Frosted Assorted" to receive Frosted to Blue, Frosted to Red, Frosted to Orange, Frosted to Purple, Frosted to Smoke, Frosted to Yellow, Frosted to Pink, Frosted to Green. Order must specify "Colored" or "Frosted" Assortment to receive these colors. Repeat orders will be filled with the exact same colors as the original order unless otherwise specified on the order. Custom Colors :	10,000 pc. minimum. Contact factory for color spectrum. Not all colors are available. Lid Colors :	Standard Lid: Add $.125 (G) per lid, unassembled. Coin Slot Lid: Add $.18 (G) per lid, unassembled. Lid Colors: Frosted only. Imprint Area :	3-7/8" W x 3" H per side. WRAP 8" W x 3" H. Please note wrap will not wrap completely around item. Please refer to imprint area in template. Ink Color Match :	$40.00 (G) per color, per order. Cannot guarantee exact match on colored surfaces. Change Ink :	$35.00 (G) per change. Must be at least 1/2 the lowest quantity offered. Multi-Color Imprint :	Available on one side only. Registration will vary 1/8'' in any direction, making close registration impossible. 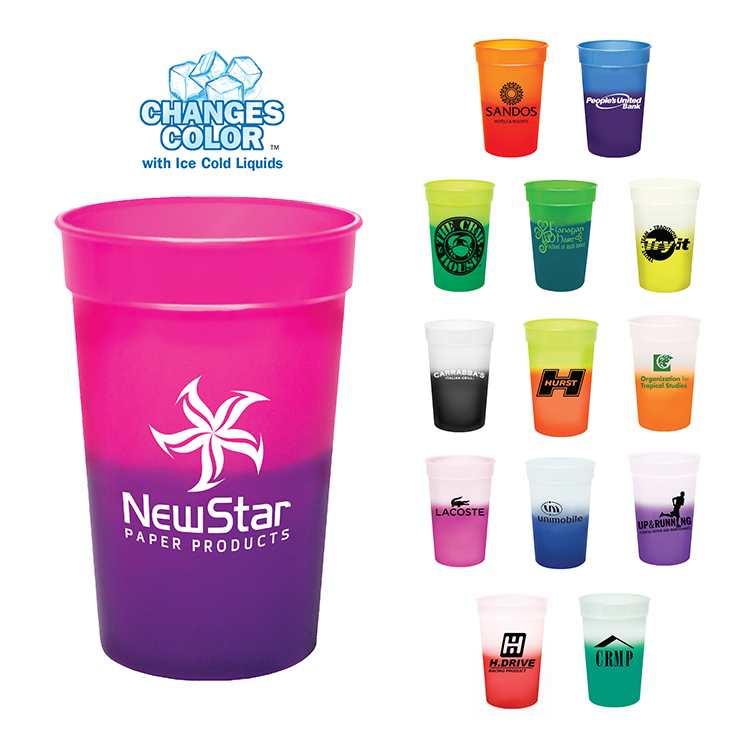 $45.00 (G) set-up charge per color, plus $0.30 (G) running charge per item, per color, on new orders and reorders. 2nd column quantity break minimum for multiple color imprints. Less Than Minimum :	Not Available. Proof :	E-Proof $10.00 (G) each, Product Proof $40.00 (G) each (suggested when color matching is critical). Artwork charges are additional if required. Copy Change :	$35.00 (G) per change. Must be at least 1/2 of the lowest quantity offered. Additional Artwork :	The first 1/2 hour is FREE! Additional time will be charged $35.00 (G) per hour. FOB :	This item is manufactured in both the TN and NY plants. This designation depends on production schedule, not geographic location. Shipping Weight :	30 lbs/500 pcs. Cups: Boxes are subject to "Oversize" and "Dimensional Weight" charges. Lids: 13 lbs./M. Packaging :	Standard Packaging is 500 per box. Lids are shipped separately, unassembled. Warning :	Severe weather conditions may effect the mood change. BPA Free :	All AAkron drinkware items are BPA FREE. For BPA FREE stickers placed on the bottom of drinkware items, add $0.12 (G) per piece. Please Note :	Please Note: “Frosted” cups will have a slight color tint and are not a pure frosted color.